The snack food aisle is filled with enticing snacks that claim to be bursting with fruit and veggies. Unfortunately, many of these snacks are not what they appear. Instead, they are junk food masquerading as a healthy snack. 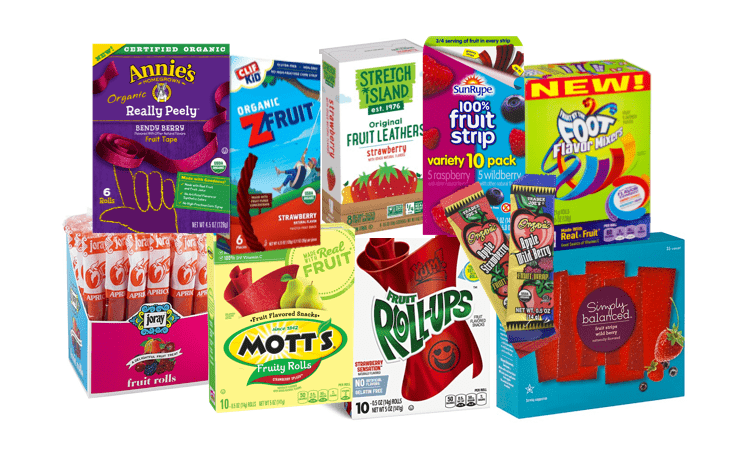 Fruit roll-ups and fruit strips are examples of healthy looking snacks that are often just well-marketed candy. Fruit strips and fruit roll-ups should only contain dehydrated fruit. Fruit is a healthy, naturally sweet snack that, when consumed in its whole form, is nutrient dense and part of a healthy diet. 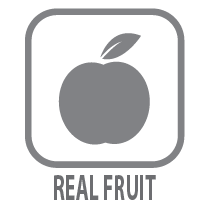 How do you know if a fruit strip contains real fruit? Read the ingredient list. Fruit, typically in the form of a puree, should be the first ingredient. Also, look for fiber on the Nutrition Facts label. Real, whole fruit contains fiber. And the more fiber a fruit roll-up or fruit strip contains, the more whole fruit in the snack. Added sugar is the last thing we need to be eating. Yes, a little added sugar is okay, but the typical American eats almost a half cup of added sugar each day and this excess sugar consumption is making us overweight and chronically ill.
Corn syrup, tapioca syrup, and cane sugar are all forms of added sugar that are common first ingredients in fruit snacks. And while apple and pear juice concentrate sound healthy, the FDA considers fruit juice concentrates to be a form of added sugar.1 Remember, if a type of added sugar is the first ingredient in a fruit snack or fruit roll-up, it is candy! What about fruit snacks containing organic sugar? Organic forms of added sugar cause the same health problems as conventional sugar. Fruit roll-ups made from mostly organic sugar or organic fruit juice concentrates are organic candy, not healthy snacks. When evaluating the amount of added sugar in a fruit bar, we looked at the location of added sugar on the ingredient list. Was added sugar the first ingredient? Was it the second? Or was added sugar farther down the ingredient list? Fruit contains natural sugar, which when consumed in its whole form (ie a piece of fruit), this natural sugar is considered part of a healthy diet. Because all fruit strips contain at least some fruit, the exact amount of added sugar in each snack could not be determined. Therefore, quantity of added sugar was estimated based on the location of added sugar on the ingredient list. And yes, if added sugar is the first ingredient, the “fruit roll-up” is actually candy. 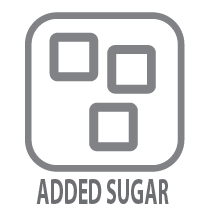 All forms of added sugar are listed below in red. 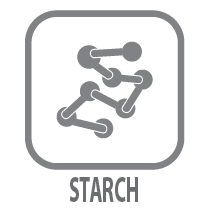 Pectin, maltodextrin, modified corn starch, xanthan gum, and locust bean gum are all polysaccharides that are commonly found in fruit roll-ups and fruit strips. These fillers are not nutrient dense and should be avoided. Artificial colors, preservatives and flavors are frequently used in processed snacks. They are an inexpensive way to enhance the fruit-like flavor and color to a processed food. I have discuss why it is best to avoid artificial colors and preservatives in previous posts on choosing healthier breakfast cereals and choosing healthier granola bar. Though several kid favorite snacks have been reformulated in the past year to remove artificial colors and preservatives, it is still important to check a product’s label for these ingredients. Which popular fruit roll-ups and fruit strips are healthy? 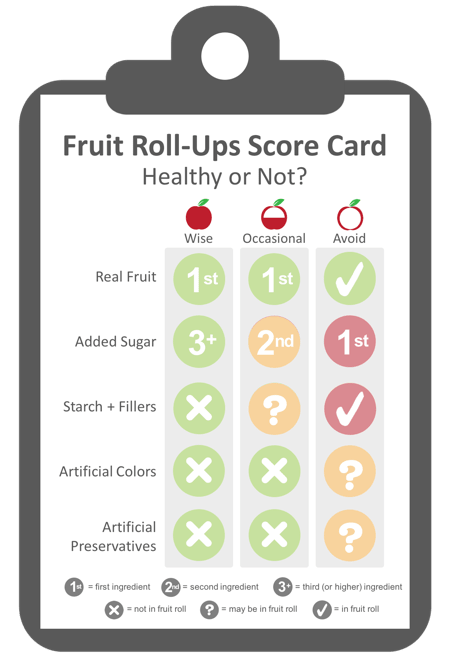 Top selling fruit leathers and fruit strips were evaluated using the criteria below.4-13 Unfortunately, while many fruit roll-ups have fruit as the first ingredient, they could not be rated as “wise” simply because they contained too much added sugar. This is a common problem with processed foods, especially snacks marketed to children. 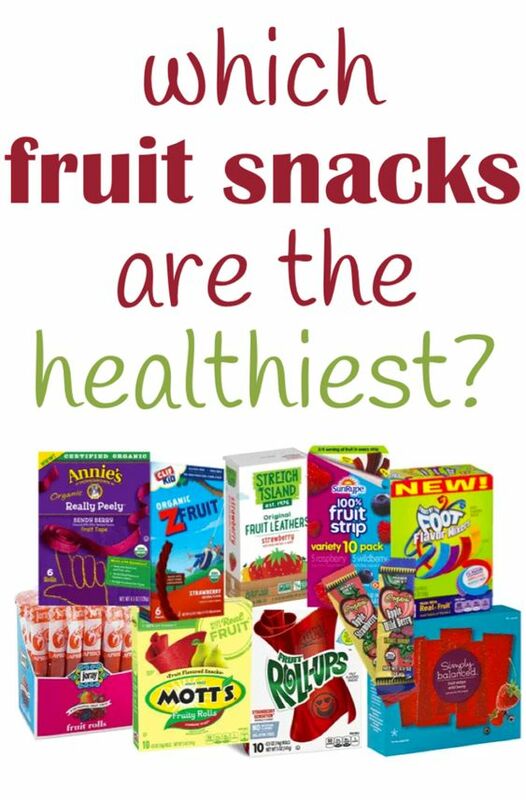 Fruit strips and roll-ups tend to be a bit healthier than fruit snacks. The first ingredient in a healthy fruit strip is generally pureed fruit. However, the majority of fruit roll-ups still contain a decent amount of added sugar and fillers like modified corn starch, so it is important to read the ingredients and shop carefully. A healthy fruit strip should be mostly fruit, preferably all fruit. 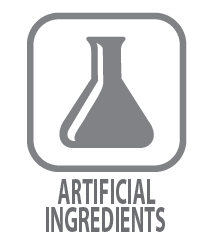 Added sugar (even fruit juice concentrates) should be low on the ingredient list, which indicates a relatively low amount in the snack. The healthiest fruit roll-up is one that you make yourself. Though, we did find one healthier option that was predominantly fruit puree. Strawberry Ingredients: Apple puree concentrate, pear puree concentrate, strawberry puree, lemon juice concentrate, strawberry juice concentrate with other natural flavors. Healthy-looking fruit strips and fruit roll-ups can contain excess added sugar. Juice concentrates are a form of added sugar, so consider only eating these snacks as an occasional treat. Mixed Berry Ingredients: Apple puree concentrate*, apple juice concentrate*, natural flavors*, malic acid, pectin, colored with fruit and vegetable juice, sunflower oil*, carnauba wax*. Wild Berry Ingredients: Apple puree concentrate, apple juice concentrate, natural flavor, citrus pectin, lemon juice concentrate, strawberry juice concentrate, raspberry juice concentrate, blueberry juice concentrate, citric acid, ascorbic acid (Vitamin C), vegetable and fruit juice (carrot, blueberry) for color. Apple Wildberry Ingredients: Apple puree concentrate, concentrated cherry, raspberry, blueberry, cranberry and boysenberry juices, natural flavor, strawberry juice concentrate, lemon juice concentrate, citrus pectin, natural flavor. Apple Wild Berry Ingredients: Apple puree concentrate, apple juice concentrate, strawberry puree concentrate, raspberry puree concentrate, citrus pectin, elderberry juice concentrate, natural flavors, lemon juice concentrate. Many fruit rolls-ups are fruit flavored candy masquerading as a healthy snack. Other fruit strips contain unwanted artificial ingredients. It is best to avoid the following fruit leathers and fruit rolls. Bendy Berry Ingredients: Pear juice concentrate*, apple juice concentrate*, dried apple*, sunflower oil*, tapioca starch*, raspberry puree*, strawberry puree*, color* (carrot* and blackcurrant* extracts), citrus pectin, ascorbic acid (Vitamin C), citric acid, natural berry flavor. Strawberry Splash Ingredients: Pear puree concentrate, sugar, maltodextrin, corn syrup, palm oil, carrageenan, citric acid, sodium citrate, monoglycerides, acetylated monoglycerides, color (carrot and apple juice), Vitamin C (ascorbic acid), malic acid, xanthan gum, locust bean gum, natural strawberry flavor, potassium citrate. It is best to avoid carrageenan, a polysaccharide polymer, commonly used in processed food. An explanation on why it is best to avoid carrageenan is can be found in a previous post on choosing healthy granola bars. Strawberry Ingredients: Corn syrup, dried corn syrup, sugar, pear puree concentrate, palm oil, citric acid, sodium citrate, fruit pectin, monoglycerides, malic acid, dextrose, Vitamin C (ascorbic acid), acetylated monoglycerides, natural flavor, color (red 40, yellows 5 & 6, blue 1). Strawberry Ingredients: Dried apricots*, corn syrup solids, sugar, enriched flour, dehydrated strawberries, citrus fiber, citric acid, artificial flavor, Red 40. *Contains sulphur dioxide (to preserve color). Strawberry Splash Ingredients: Pears from concentrate, corn syrup, dried corn syrup, sugar, partially hydrogenated cottonseed oil, vitamin C (ascorbic acid), citric acid, sodium citrate, acetylated monoglycerides, fruit pectin, malic acid, dextrose, vegetable and fruit juice added for color, natural flavor. Fruit leathers, fruit strips, and fruit roll-ups are healthy sounding snacks. However, many fruit roll-ups contain too much added sugar and possibly even artificial ingredients. These products are fruit flavored candy, not healthy snacks. Fruit, in its whole, unprocessed form, is the healthiest fruit snack we can eat. Fruit snacks made from whole, minimally processed fruit are the next best thing. Did you know that you can make your own homemade fruit roll-ups? With just two ingredients and some time, you can make delicious and healthy blueberry fruit roll-ups! Where can you buy the Stretch Island fruit leather? Costco and Amazon both sell large variety-packs of the Stretch Island fruit leather.